Giveaway Alert! One lucky winner will receive their own E-cloth Kitchen Pack (Valued at $17.98). Entry form below. ECO-ngratulations Cinella! You Win! Check your email! It’s rather ironic that I hate to clean and I’m doing a whole week of cleaning reviews! Why do I hate to clean? Mostly because I can’t stand the smell of all of those nasty cleaning chemicals. However my husband will tell you it’s just because I’m always on the computer and too busy to clean! A few months ago I got an email from a company called E-cloth asking me to try their product. I have to tell you that I was a bit skeptical of this company that claims to be able to clean with their cloths and water, no chemicals at all! Huh? No bottles of soap? No scouring pads? Just cloth? I was a bit intimidated with their selection of cloths too. They offer cloth specifically for cleaning kitchens, bathrooms, electronics, furniture and more. Why would I need all of these different packs to clean my house? Like I said, I was a bit skeptical! I opened them as soon as they arrived and was very curious! I’ve mentioned before that I work full-time during the day from home. I’ve also mentioned that I’m very fortunate to have Lil’ B stay home with me. Since she’s become so mobile we have hired a really nice lady to help me out during the day. While Lil’ B sleeps she is very helpful around the house and was actually the first person to try the E-cloths. She started with the E-Cloth Kitchen Pack and began to clean the kitchen with the general purpose cloth. Our kitchen is a small galley style kitchen so there isn’t much to clean; a very small counter area and the appliances. We have one of those flat, glass top stoves and it’s always dirty. I have to use a special polishing cream to get it nice and shiny. There is no way this soft green cloth is going to clean my stove top. Next thing I know she’s calling me into the kitchen to show me the results. We were both shocked! Using only the E-cloth and a little bit of water my entire kitchen was clean and streak-free. No kidding, it was clean! How does it work? E-cloths are a high quality cleaning cloth. The fibers of the E-cloth are so fine that they lock in dirt and moisture. They can even pick up dirt and grease effectively. The grease cutting ability is one factor that makes the general purpose cloth such a great choice in the kitchen. 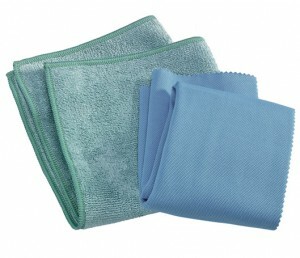 The E-cloths are also great for removing bacteria, including E coli. What do they clean? The E-cloth Kitchen Pack contains one general purpose cloth and one glass & polishing cloth. The general purpose cloth is so versatile that it will clean stainless steel, counter tops, chrome, granite, tile, marble and wood. The glass and polishing cloth is intended for light cleaning, glass, and as a final polisher. Money Saving & Green! Because you can reuse E-cloths over and over again you can reduce your need for both paper towels and cleaning products. E-cloths can be machine washed in hot water over 300 times. If you wash them once a week one set of E-cloths will last you over 6 years! No that’s what I call a responsible product! The price point of the E-cloth Kitchen Pack is $17.98 and you get both the general purpose and the glass and polishing cloth. I think the price might scare some people away from trying these. However, if you divide that out over the 6 years then E-cloths will only cost you about $3 a year. That’s cheaper than one bottle of household cleaners! Environmentally speaking you are making a trade off with E-cloths. On one hand you are saving hundreds of trees from becoming paper towels, but on the other hand the E-cloths are made in Korea from petrochemicals (chemical products made from petroleum). The fabric is made from 80% polyester and 20%polyamine (or nylon) which are synthetic fabrics. They are packaged in plastic and obviously they have been shipped long distances before they reach your home. Which is actually better for the environment? Overall opinion? I like the E-cloths. I think they work very well, surprisingly well! I have reduced the amount of paper towels that I’ve used around the house. They clean better than cotton cloths and are much more absorbent. I use it regularly in the kitchen and dining room because it doesn’t leave streaks and it easily wipes up the grime! And with kids you know there is a lot of grime! Food gets smeared all over the highchair and the E-cloth gets it off easily. And the glass stove top…it’s never been cleaner! Yes, I like E-cloths! Would you like to try E-cloths? The Kitchen Pack sells for $17.98 and E-cloth is currently offering FREE SHIPPING on ALL orders! One lucky winner will receive their very own E-cloth Kitchen Pack. Win It! To enter to an E-cloth Kitchen Pack you must visit E-cloths and leave me a comment below telling me about one thing you learned about E-cloths that I did not tell you. That’s it! It’s that easy to enter! Extra entries! Yep, as always you can enter more than once! Each entry below is worth one extra entry into the giveaway. You must have answered the Win It! question first in order to qualify for the extra entries. 1. Follow both @TheEcoChic and @Eclothon Twitter. Leave an individual comment with your @Name. 2. Tweet about the giveaway up to twice daily. Include both @TheEcoChic and @Eclothand a link back here in your tweet. Leave an individual comment with a link to your status tweet. Leave your comments HERE to complete your entry to this contest. ECO-ngratulations Cinella! You Win! Contest ended Sept. 11th at midnight (EST). Good luck and clean green! I found out that the E-cloth is capable of rapidly absorbing up to 7X its weight in water! It would be great for cleaning my kitchen surfaces. Thank you! You can get rid of the film on new stainless steel appliances with using a couple kinds of e-cloths. Was already following you, of course. 🙂 Now I’m following Ecloth! I learned from the diagram how it works compared to just a cotton cloth. It traps dirt instead of pushing it around because the fibers are split. I learned the e-cloth is machine washable and was awarded the green living award by Good Housekeeping. Something I learned about E-cloth is the advanced fiber technology and superior raw materials take microfiber to its highest level of cleaning effectiveness. The Shower Cloth comes with a suction holder for drying your shower cloth after use. just tweeted it out via @safespray! hope the word gets out! this looks like a great product! You can also use E-Cloths on your car! Was wondering how it wouldn’t leave e-coli and such without nasty chemicals. Also learned that you can use cleaners if you have to and it won’t wreck the clothes. E-cloth’s fiber is about 1/100th the width of a human hair. following both on twitter @momof3dolls. Organizing your home outcomes in you feeling positive inside. When you feel calm and “ordered”, you really feel empowered. Whenever you really feel empowered, you feel confident.